After a long day it can be agreed upon that we all just want to sit back, relax, and pamper ourselves when it comes to bath time. Unfortunately, I am not so much a bath person. I actually prefer showers instead. It is a shame though because I know baths are very soothing, as well as relaxing. The thought of missing out on the possible fun and relaxing bubble baths saddens me! Who knows, maybe one day I will get out of this no-bath rut. But when it comes to showering, I mean business! I wash my hair, I ex-foliate, etc. My favorite part is after I hop out of the shower and I lotion myself up. I really think lotions can be quite calming once applied. The soothing aromas and such all does me a world of good and makes me forget about stressful school days. Here are some of my craves/picks in this edition of Beauty Crave. If you have any of the items mentioned above, please let me know what you all think of them. I would love to know! 1. 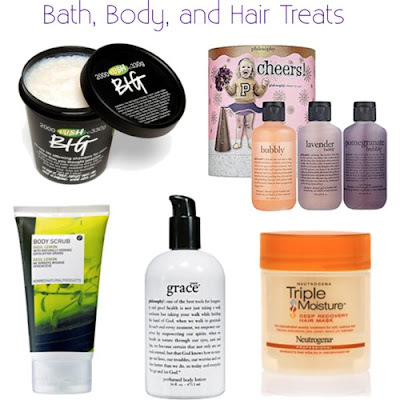 Lush BIG Shampoo ($22.95)- I know many are fans of this much raved about shampoo from Lush. I have never tried any hair products from them so I am quite curious as to how this shampoo would work on my hair. I have dry and frizzy hair. I wonder if this could tame it-in fact, I wonder if anything can LOL! According to the Lush site, BIG shampoo is great for providing volume for those who have flat hair that may be hard to volumize. A few main ingredients contained in BIG are seaweed which is used to strengthen the hair, lime juice, used for making the hair shiny and a very interesting ingredient which I have never imagined would be in shampoos, sea salt. As far as I can tell from pictures of BIG, the shampoo seems very thick and textured. I wonder if a little bit goes a long way when it comes to making the shampoo lather up. 2. Philosophy Cheers (TM) Set ($25.00)- Of the few Philosophy shower gels/cleansers I have tried, I really enjoy them. They make for an amazing, and sometimes yummy experience when they are dessert scented. My only qualm with the shower cleansers is that the smell does not last on me at all. When I shower I smell all that yummy goodness, but as soon as I am out of the shower-BAM! Smell is undetectable. I guess this is a good quality for those who don't like to have any scent on them but I am all for yummy smells! But honestly, it does not bother me much if the smell fades away on me. I can just layer a body lotion on top and I will be fine. All in all, the Philosophy shower gels are amazing shower treats and I can't wait to get more. How cute is this limited edition gift set? Scents included are lavender, pomegranate, and Bubbly. I wonder how Bubbly smells like? I am glad that there is a lavender scent because as you all know, lavender is a super soothing smell. 3. Korres Basil Lemon Body Scrub ($8.50)- I love body scrubs. I know body scrubbing is a MUST for those of us who are constantly self-tanning at home with tanning lotions and sprays. Ex-foliating provides a smooth , and flake-free base for achieving that perfect streak free tanning application. Using a scrub is essential for summer, but also for these coming colder winter months that leave us with dry, scaly skin. This online-only body scrub from Korres contains all natural ingredients, YAY! And is formulated without parabens, sulfates, mineral oil, and other chemical ingredients that our skin does not need. The Korres Basil Lemon Body Scrub contains plant extracts, is dermatologist tested, and contains a fun citrus scent. I love that this body scrub is in a tube, as opposed to in a tub like other body scrubs usually are. Makes for an easy and mess free application. 4. Philosophy Pure Grace Perfumed Body Lotion ($34.00)- I LOVE Philosophy's Pure Grace Body Lotion! I apply it everyday to my arms and legs and I love the way it smells. I can't really describe the smell but if I had to, I would just say that it smells clean and fresh. Like you just hopped out of the shower. The lotion is very creamy and penetrates really nice and fast into the skin. I especially love the fact that this body lotion is in a pump bottle and it leaves my skin feeling soft and smooth and not sticky and tacky like some other body lotions feel on me. Currently in my shower, I have the Pure Grace Foaming Bath and Shower Cream ($22.00) and I love it as well. In fact, I am almost running out! Don't let the price scare you, believe me when I say that this stuff will last you a VERY long time. 5. Neutrogena Triple Moisture Deep Recovery Hair Mask ($7.49)- I have been using this hair mask from Neutrogena for about 2 months now and I really enjoy it. It smells really nice, and it definitely makes my hair more manageable and easier to style. Stay tuned for an upcoming review on this hair mask. But I do recommend this product for those who have dry and damaged hair. You may like it.